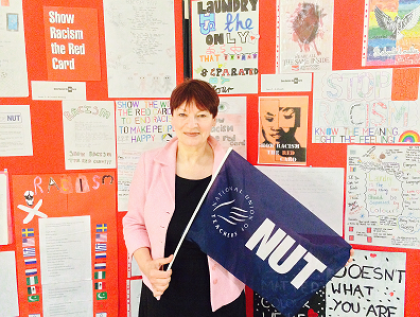 "As General Secretary of the NUT I'm immensely proud of the work we do with Show Racism the Red Card. Racism remains a scourge of our society. I'm asking you to demonstrate against it by wearing red on October 23rd." "Why not brighten up your day and make a stand against racism at the same time? "Show Racism the Red Card is asking you to wear something red, anything from a whole outfit to a pair of socks on October 23rd and the NUT is encouraging you to join in. "As General Secretary of the NUT I'm immensely proud of the work we do with Show Racism the Red Card. Racism remains a scourge of our society. I'm asking you to demonstrate against it by wearing red on October 23rd. "There is of course lots more you can do too. Why not invite Show Rcism the Red Card in to do a project in your school and of course enter the School competition. Details from the Show Racism the Red Card website. "Together we really can put an end to all forms of racism." More details about SRtRC Wear Red Day 2015.